Hi there snow fans! As we head into the first full week of lessons the students are as enthusiastic as ever, and excited to meet their new instructors! We met at the usual spot and grabbed some coffees to set us all up for the full day ahead! With fresh legs and pumped up attitudes we all split off into ski and snowboard groups and headed for the chair lifts! This week has been mostly focused on riding improvement and getting those old bad habits erased and new techniques introduced! At this point in the season we see the most dramatic changes and people are shocked at how much they’ve already improved in such little time! Although all the students can already get down a hill they don’t always come with the most efficient and smooth styles ?! Listening to evening conversations throughout the week, the students talk of how just the little things can make a massive difference to their riding. Things like bending the knees more or looking over the shoulder or getting onto more of an edge, can change a skier or boarder into a pro! Which is what everyone has come here to be! Monday night brought the first dump of snow so everyone headed out for the first lists on Tuesday morning! 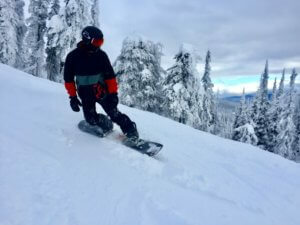 A 2cm forecast turned into a 15cm pow down! Laughing and screams of delight and a lot of whoop whoop whooping could be heard for most of this week as we all powder slashed our way down the slopes and through the trees! Some of the students had never experienced snow this deep and fluffy so it was great to see all their reactions at the end of each day as the snow kept on coming every evening! Friday was debrief day and everyone gets personal feedback and a chance to hear the progress they have each made and also what they need to work on! As a general consensus all the students are doing fantastic and the standard has been high! We’re so proud of them all and happy to see them pushing boundaries and becoming more confident in such a short time already! 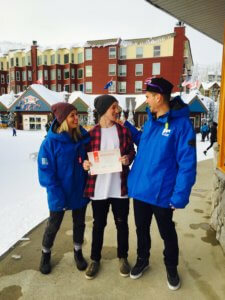 We also have a big congratulations to say to one of our returning students who passed his snowboarding CASI level 2 this week and it was also his birthday! 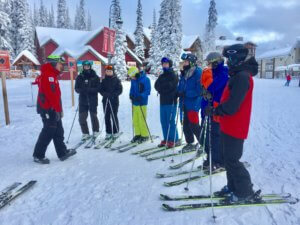 Sam injured himself early season last year so has returned to Big White at the beginning of this season to train and now complete the course with us and move into his level 3! Well done Sam , you’re a true NothinButSnow legend! Friday evening was another big social event and we all went out for dinner at the new Bull Wheel restaurant…. Where the famous Bull Wheel burger with bacon Jam was on the menu! We celebrated Sam passing and one of our other students, Cory’s birthday as well ! 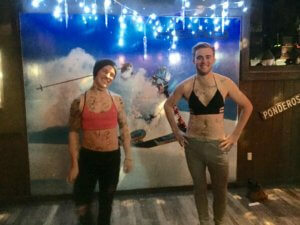 In true NBS style we made the two boys go head to head in a pub olympic challenge! They boys were great sports and everyone got fully involved! What a night! The recoveries had to be quick as on Saturday we all headed down to Kelowna to watch the big Kelowna Rockets ice hockey game! This is often one of the best events we offer to the students and it did not disappoint! 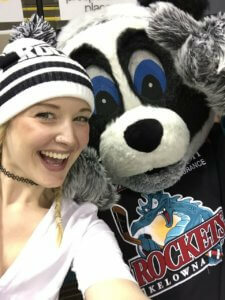 We cheered the Rockets onto a 4-1 victory against the opposing USA team , the Portland Winterhawks … And met Rocky, the mascot!! Sunday is a day of rest for most so we look forward to next week , hopefully filled with more snow dumps and many more stories of epic skiing and snowboarding tales! Lots of fresh snow love , Joey and Ant.